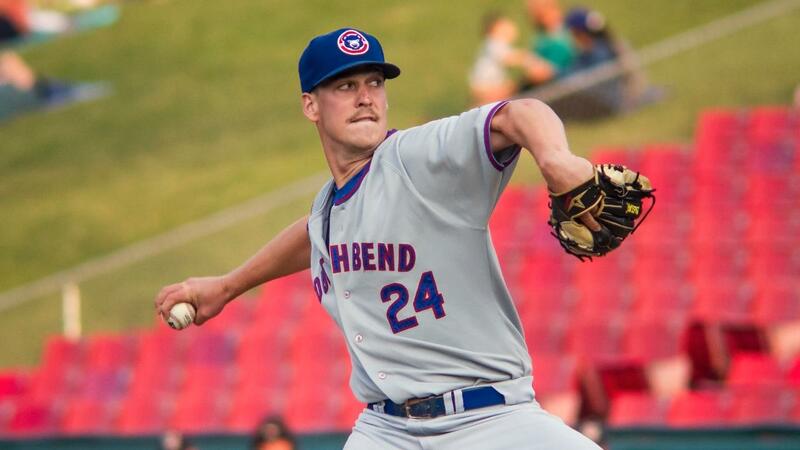 Midland, MI: Offensively, it was a quiet day between the South Bend Cubs and Great Lakes Loons on Monday afternoon from Dow Diamond in the series and regular season finale. With both teams each not driving in a runner from scoring position all day, it took some 9th inning magic for South Bend to walk away with the 1-0 shutout victory. The plan of the day was to have left handed starter Brailyn Marquez be followed by piggyback righty Jeffrey Passantino to close the 2018 season. In the 2nd inning, Marquez was struck by a line drive on the right knee, he went down to the ground in pain. After being checked out by Manager Jimmy Gonzalez, Pitching Coach Brian Lawrence, and Athletic Trainer James Edwards, Marquez stayed in the game and finished the second inning unscathed. He was pulled after two innings and ended with four strikeouts. Passantino's day got going a little earlier than expected, but it didn't phase him. Out of the bullpen, Passantino fired four innings of scoreless relief and struck out seven in a no-decision effort. The Cubs 40th round selection in the 2017 draft made waves in South Bend by putting together dominant performances nearly every time out. The rest of the way was taken by right handers Brendan King and Brian Glowicki. King pitched two innings and posted all zeros. No hits or runs given up by King put him in the position for the win as the Cubs broke through in the 9th. South Bend got a break thanks to the Loons defense in the 9th. Knowing the bats were cold on both sides, the Cubs used a defensive error on the Loons side to their advantage. With a tailor made double play ball hit by Cam Balego, the Cubs catcher respected 90 and sprinted down the first base line. On a throwing error made by second baseman Devin Mann, Jimmy Herron came home to score after advancing to third on the ground ball. The second error of the game by Great Lakes led to the 1-0 lead. In the 9th, Glowicki shut the door and picked up his 18th save. The 18 saves rank and finish Glowicki second in the league to finished 2018.